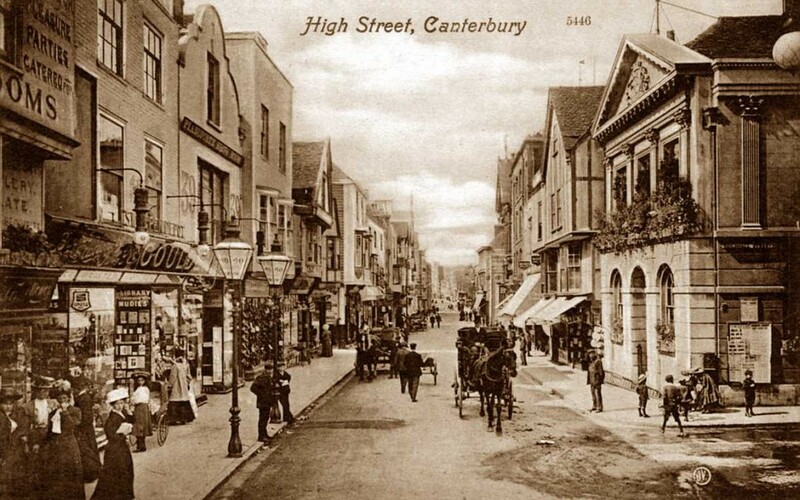 Millions of words must have been written in praise of Canterbury since Chaucer wrote his Canterbury Tales in the late fourteenth century. And indeed most of them, whether reverential, spiritual or just appreciative, have hardly been misplaced. It is a truly wonderful city – although whether the post war town planners preserved its heart or else embalmed and cut off its lifeblood amid a series of arterial roadways, junctions and contraflows, is quite another matter. So, let’s visit Canterbury! Most travellers head for the Cathedral or the Cathedral Church of Christ, Canterbury, if you want to be precise. But if you want to visit and even older building and find peace and contemplation, I suggest you go to St Augustine’s Abbey instead (English Heritage). You’ll find plenty of saints but fewer sinners. When I went there couldn’t have been more than a dozen souls in a vast expanse – although the Cathedral was in view most of the time. I suppose I’ve always enjoyed visiting historic Abbeys. It’s partly the cut away nature of the ruins that allows more than a slice of the imagination to fill in the gaps. Castles are all very well, but trying to picture the life of medieval monks does require a certain amount of contemplation. In reality, there were often relatively few monks and it was the lay brothers and others who did most of the actual work, required to support a lifetime of prayer and remembrance. And so to the saints resting after their temporal labours! Apart from St Augustine himself, it’s the burial place of his successors, Saints, Lawrence, Mellitus and Justus. There also space for early Saxon kings, such as Ethelbert’s tower and Queen Bertha, commemorated by a Queen-in gate. The Normans extended the original church and the twin western towers were the last to be completed by Abbot Hugh I in 1120. At the time the Abbey and the Cathedral, both Benedictine houses would have looked similar. The ruins of the chapel of St Pancras are partly built of Roman brick and thought to date from the 7th century. The built up remains of Abbot Wulfric’s rotunda are also clearly visible and just pre-date the Norman Conquest. At the Dissolution, the church was largely torn down with stone being transported across the Channel to aid the defences of the castle at Calais. The Abbey became a sort of royal staging post on the London to Dover route as can be seen from Tudor brickwork above the blocked up Norman arcades on the north aisle. Work must have been completed in double quick time, because Anne of Cleeves stayed there in 1539 on her way to an ill fated marriage with Henry VIII. This and not the cathedral was the original centre of Christianity in England. Overlooking the cathedral, the Abbey was itself overlooked and its significance largely forgotten until the early nineteeth century. Close by is St Augustine’s College, built in the 1840’s to train missionaries across the Empire. It was the college’s founders who were largely responsible for putting the Abbey back on the historic map and beginning restoration work. It’s now King’s School and is distinguished by an impressive Abbey Gate, (Fyndon’s Gate) built around 1300 by Abbot Fyndon. Nearby is St Martin’s Church which can claim to be the oldest church in regular use in England since it’s though to even pre-date the building of the Abbey. The oldest parts of St Martin’s are probably Roman with Saxon additions. It’s certainly worth a visit as part of a trip to both Cathedral and Abbey. The Abbey is a pleasant place to stop and wonder, and then wander about in peace a amid the ruined stonework and grassy banks; appropriately enough all the while just a stone’s throw from the centre of the modern city.